Last month, as part of its World War II Exhibit, “We Can Do It! WWII,” the Mt. Lebanon History Center hosted some World War II veterans, who shared their experiences. Here are two of their stories. 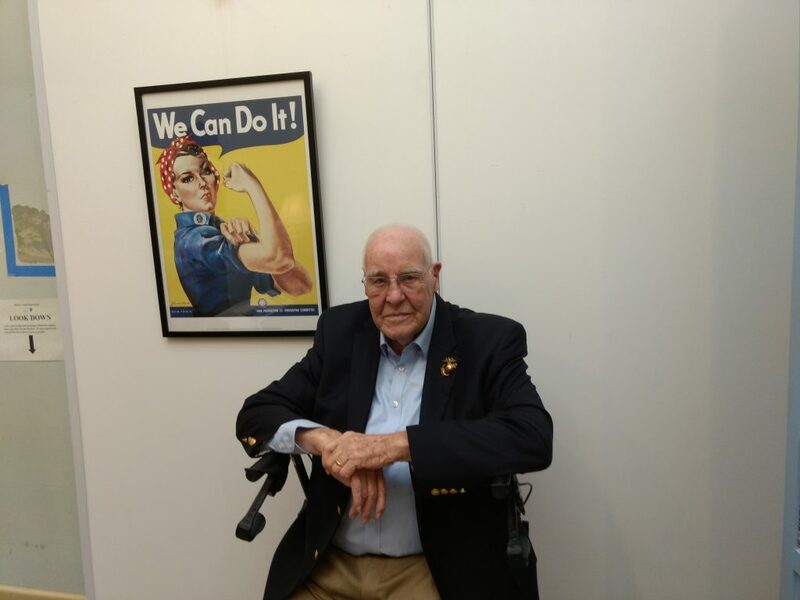 Jack Watson saw combat on Iwo Jima. Jack Watson was in his last year of high school when the Japanese bombed Pearl Harbor. He enrolled at Penn State the following September (1942), but by November he had enlisted in the Marine Corps. He was trained as a radio operator, and then selected for training as a radar operator, which was a lengthy, six-month school. So he tried flunking out, but it wasn’t as easy as he thought it would be. The battle for Iwo Jima was originally expected to last three days. 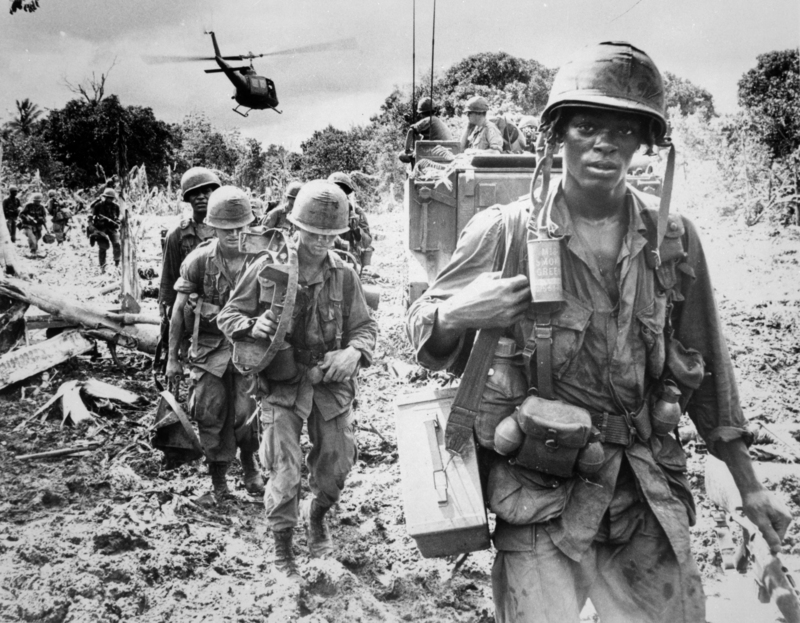 Marines fought fiercely for more than a month before the island was secured. The threat worked. Watson finished the course, only to find upon graduation that the Marine Corps decided after all that it needed infantrymen more than radar operators. Watson was assigned to the 4th Marine Division’s 24th Regiment. In February, 1945, Watson, now a sergeant but still a replacement with no permanent assignment, was on a troopship, the U.S.S. Artemis, en route to Iwo Jima. Located just 750 miles from Tokyo, the island was key to the U.S. air campaign. His regiment was held in reserve and the 4th Division’s other two regiments, the 23rd and 25th, landed on February 18. But the casualties were high in the first few hours. “They planned for a three-day operation,” says Watson. From his vantage point of the Artemis, Watson watched the landing of five Marine regiments, 10,000 or more troops. They met with no resistance at all upon landing. It wasn’t until the Marines were 50 to 100 yards or so from the beach that the Japanese opened fire. Watson saw Marines being cut down by machine gun fire and blown up by mortars. “You just knew it was going to be trouble. 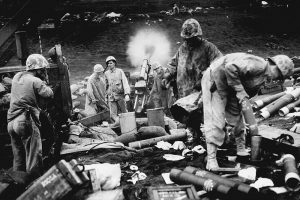 So we knew at that point that the three-day thing was off.” The battle for Iwo Jima lasted more than a month. 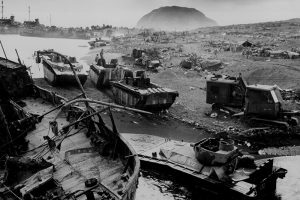 Watson spent 24 hours in a landing craft because the beach at Iwo Jima was too cluttered with debris to permit a landing. 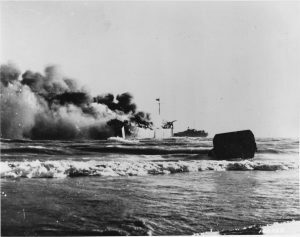 Watson was in a landing craft bound for the beach the following day, but the beach was so littered with debris and destroyed equipment that the ship had no place to land. He spent the night cruising in circles. The grim aspects of infantry combat have left Watson with memories that remain just as clear now as they were in 1945. Following the battle of Iwo Jima, Watson and the rest of the 4th Division shipped off to Hawaii, where they began to regroup and start training for the invasion of Japan, which never happened. Peter Maurin served on ships that delivered troops and equipment to the beaches in amphibious invasions. Peter Maurin boarded his first ship, LST 313, in the New York Navy Yard shortly after Christmas 1942. LSTs were used in amphibious assaults to carry troops, vehicles and equipment from ship to shore. They had the capacity to carry up to 25 tanks, or 30 trucks, with berthing capacity for more than 200 troops. LST 313’s first action was also its last. While transporting troops to Gela, on Sicily, the ship was attacked and sunk by German aircraft on July 10, 1943, killing 21 and wounding many more. Maurin’s first ship, LST 313, was sunk by German bombers during the invasion of Sicily. He and the ship’s other survivors were picked up by a rescue boat and taken to North Africa. Maurin and the other LST 313 survivors were picked up by other boats and transported to North Africa. From there he returned home for an automatic 30-day survivor’s leave. While he was home he married his longtime sweetheart, Eleanor Seehorst. The two were together for 71 years until her death in 2014. Maurin picked up his second ship, LST 286, right at the factory door, at the Dravo Shipyard in Ambridge. “We crossed the Atlantic in 12 days,” says Maurin. 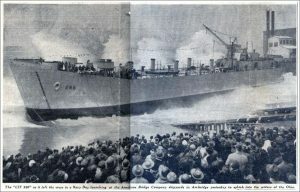 “We got there just in time for D-Day.” In the aftermath of D-Day, the invasion of Nazi-held France on June 6, 1944, LST 286 made six trips across the English Channel, bringing supplies and fresh troops to France and transporting wounded soldiers to England. 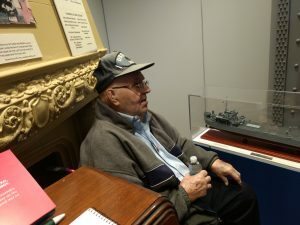 Although not a hospital ship, Maurin says the LST carried two Navy surgeons to care for the troops during the crossing. After the sixth trip, LST 286 got caught in a storm and sustained extensive damage, requiring it to go into drydock for repairs and replacement of a propeller. “After that, they sent us down to the Med, for the invasion of southern France.” Maurin spent the rest of the war ferrying troops and supplies around the Mediterranean. Maurin was one of the original crew, called “plank owners,” of LST 286, which was built in Ambridge. The ship was part of the Normandy invasion in June 1944, and the invasion of southern France two months later. He attributes his success in the Navy to his early experience with the Civilian Conservation Corps (CCC), one of Franklin Roosevelt’s New Deal programs that created jobs for unemployed men. The CCC was run by the Army along quasi-military lines. “It was in the CCC camps that I learned how to take orders and how to give them,” he says. As a Chief Machinist’s Mate, he was responsible for the operation of the ship’s engines, and supervised the engine room crew. “I was a cabinet maker in civilian life, and here they’re putting me with this diesel engine,” he says with a smile. The Mt. Lebanon History Center is hosting a Senator John Heinz History Center exhibit called We Can Do It! WWII now through January 29. The Historical Society of Mount Lebanon’s hours are Tuesdays and Thursdays, 5 to 8 p.m. and Saturdays, 9 am. to 3 p.m. Visit www.lebohistory.org for more information and updates on the exhibit and related events.